When the Government announced that KS3 levels were going to be scrapped, the reaction was mostly one of relief. Many people agreed that levels had become less and less to do with learning and more to do with accountability – did parents, students or staff really understand the difference between a 5a and a 6c?. This was then followed by the inevitable panic – what was going to replace them? Nothing according to the DfE – it was going to be up to schools to come up with their own assessment approach. I quite liked this. I’d always thought that the purpose of assessment should be very simple – to let students know what they know, find out what they don’t know and support them, through great feedback, to fill this learning gap. By doing so, it should also encourage them to aspire to excellence. So, I saw this announcement from the DfE as a challenge – to seize back assessment and make it useful. Is focused on which specific elements of the curriculum an individual has deeply understood and which they have not. Is based on our high expected standards of students – grows an ‘Ethic of Excellence’. Is based heavily on formative feedback and allows all students to succeed – and so develops a growth mindset. Incorporates periodic summative assessment to support this ongoing formative feedback. Does not return to a tick box approach of the early national curriculum. The result was the ‘Growth and Thresholds’ model of assessment. Essentially this involves teachers identifying the key knowledge and skills students need, in order to be successful in KS4; working backwards and thinking what this would look like, if students have mastered it in KS3 – the excellence standard; producing a framework that would allow us and students to know what they’ve got to do to achieve excellence. The following expands this idea in more detail. At the time of writing, KS2 levels are due to stay for at least the next two years. If this changes, other measures e.g. teacher assessment, baseline tests, CAT tests etc could be used to assign a baseline threshold. 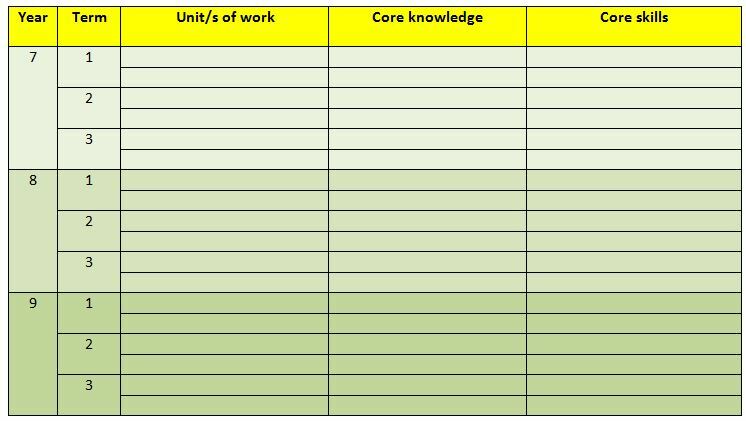 For each unit of work, subject teachers can then discuss, decide and agree what standards are expected from each threshold, in terms of core knowledge and skills, as students progress through the curriculum. The starting point should be the excellence threshold – so we set the bar high. Then scaffold down for the other thresholds. There’s another important point here – don’t assess everything. As subject specialists, we know the knowledge and skills that are important for success in KS4, so within each unit of work, just focus on assessing these. By doing this, assessment becomes aspirational, focused and purposeful. This allows them to focus in to each threshold and look at what students need to do, in order to progress within the threshold and then go on to achieve specific grades at GCSE. We as teachers set the standard of excellence that we want our students to achieve. We can then be selective about what we assess – in terms of what we think students need in order to be successful at GCSE. Rather than reporting to students and parents whether or not they have achieved a target level (which is setting a ceiling on achievement), we can focus on how they’ve done relative to their starting point – without putting a ceiling on what they can go on to do. The expectation being that all of them should be striving for excellence. It’s clear to see how much progress each student is doing, relative to their starting point. These banded thresholds of knowledge and skills can then be used to give students ongoing formative feedback, based on their day to day work, about how to improve and move through the thresholds. By focusing on exactly what needs to be assessed, teachers can give very specific and meaningful feedback, based on the thresholds. In order to support the development of a growth mindset, the feedback should be aimed at moving students through the thresholds, towards excellence, so developing resilience and grit. So expectations are consistently high – supporting the ‘Pygmalion Effect’. It will be really important that departments have regular conversations about student work and moderate what makes ‘excellence’, ‘secure’ etc in each unit of work. But, this will be hugely valuable – talking about and sharing thoughts and opinions about what makes excellence, should be a key aspect of our work, in terms of developing teaching and learning. This would also support the whole idea of celebrating an ‘Ethic of Excellence’ within a school – finding, sharing and celebrating excellent work. More here. Summative assessments e.g. termly or half termly, can be used to support this formative assessment, towards the end of a unit/s of work. 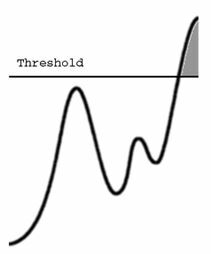 Students can sit tests, where their performance can relate to a particular threshold – which can then be compared to their baseline threshold. The ‘test score %’ on the table above are for illustration only – subjects will need to decide on suitable boundaries, based on the tests that they set. For some subjects, it might not be suitable to do a test. They will need to introduce termly/ half-termly periodic assessments that assesses across a range of threshold knowledge and skills. This is what our art department currently does, with a great deal of success. We put in an application to the DfE for an ‘Assessment Innovation Fund’ to support the development of this work. We were delighted to find out last week that, along with 8 other schools, we had been successful in our bid – details here. We will use this award to support staff within our school to work on developing the thresholds within a range of different subjects. They will then work with staff in other schools to share and develop their work. More details to follow. As I said earlier, I really do believe that this is an opportunity for schools to seize back and develop meaningful assessment. It is however a starting point and by no means perfect or finished- and as such it will grow and develop as time goes on, through trying things out, reflecting, critique from fellow professionals and of course……tweaking! This entry was posted in General Teaching and tagged assessment, assessment without levels, curriculum. Bookmark the permalink. This is such an interesting idea. I am going to give it a lot of thought. What about those students gain below Level 2 at KS2 (B,N, P levels etc.) – we are wrestling with how to include them in an all encompassing system or should they stand aside with a unique reporting system? How to deal with subjects that are very different at GCSE to KS3 (eg. PE – no theory at KS3, DT taught as a combined course at KS3 but discrete courses at KS4)? Is it right that students at the Foundation level (in your plan) are doing tests where they might be scoring only 25%? Should there be tiered tests instead so that more questions can be asked at the appropriate level? How much have parents/students been involved in the design process so far (we’ve had a parents working group and plan to discuss with students too)? How do you envisage making this available to all other schools? Schemes of work? Assessments or just the general principles? Steve – thanks for taking the time to comment. It’s really useful to get questions like this as it makes me think through the process. I’ll give you my thoughts as they are currently, but they may well change as the project goes on! – Below L2 students. They will be in the foundation threshold still at the moment, for the simple reason that I’m keen to raise our expectations of what these students can achieve. – Practical based subjects are currently coming up with more practical based summative assessments. The ‘Assessment Innovators’ will be working on this, so more later. – The figures I put in the summative table are meaningless at the moment. As we work through the assessments, we’ll get a better idea of what the %s will be. – No involvement from parents at this stage – there just wasn’t the time. But we have had consultation with parents about reporting generally and the general gist was that they preferred simpler information – which is what we’re aiming for here. – Once the assessment innovators are role in (this term, across all subjects) they will be working through examples of thresholds, which I will then share. c) it should show, in a timely manner, what they can/can’t do so we can try to help at home. Obviously we have to square those wants with our professional judgement about how best to help students progress. Thinking about the ‘tests’ you could have a system that is tiered but that scoring above a certain ‘mark’ allows students to be able to access the next tier up, and I suppose the reverse if they scored very lowly (so every student could gain every level of performance?). That way students wouldn’t be sat completing an assessment where half the time was either spent doing things that are mind-bendingly trivial or staring at questions that are wholly incomprehensible. I am thinking from a maths perspective really on this point where there is quite a defined hierarchy of difficulty in topics like, for example, solving equations. I think you have a really workable assessment model here, and one that is similar in many ways to the one we are currently grappling with in our school. I ask the following two questions because we, too, are attempting to come up with a meaningful and suitably challenging model of summative assessment, and have arrived at much the same point you appear to have. First, under the ‘Summative assessment’ subheading, you identify a ‘Developing’ student as requiring 25-50% in summative end of unit tests. Since you’ve already said these students would be pushing towards a GCSE score of 4-5 (current GCSE grade of C/B), are you not setting the bar a little low in these assessments, especially as these learners are essentially average to above average learners, based on KS2 scores? Secondly, does this summative assessment model assume that the test is a one-size fits all test that all students, irrespective of threshold level, will sit? Thanks for taking the time to reply. The %s I put on the table are not what we’ll use. They were just there to fill the table! Once we start building the assessments we’ll look more closely at the boundaries. By the same token, some subjects may decide to look at using tiered papers for the summative assessment – we’ll see. Whilst I can see the practicalities of this, it is somewhat at odds with the growth mindset approach. Will need to think this through. A great article Shaun – many thanks for sharing your thoughts (and laying them out so clearly). Much of what you propose is similar to some ideas we have been working on, but we hadn’t got as far as establishing links between baseline data, forecasts and assessment terminology (we’ve been tinkering with phrases such as “emergent”, “embedding” and “expert”), so all of this is really useful. Another issue we haven’t yet got to grips with is that of moderation: what are your thoughts on how you might ensure that you get reliable and consistent data from a range of diverse subjects? I found this very interesting and looks a lot substantial than other ieads floating around. How has this gone down with staff, students and parents? We are currently wrestling with the issue of building a system that is flexible enough to provide individual subjects with a suitable means of monitoring progress, but is also consistent enough to provide the ‘oversight’ required to identify the progress a student is making across the board, facilitating reporting and intervention. I also worry about the potential for baselines in year 7 to bring down expectations of progress: are we at risk of accepting lower outcomes because the new system allows it more easily? One thing I would be interested to hear from colleagues about is how you intend to apply the system for those students in Y8 or Y9 who have already worked through KS3 under the old levels system. Will there be a mixed economy, or will their level of progress need to be mapped onto the new system? Thanks for sharing your work – much appreciated! Thanks for sharing this Shaun, a really intriguing concept and great food for thought. As someone who has trawled various sources this is one of the best workable models I have come accross. Also struck me from the comments that this platform has been a great initial way to test your ideas. One thing I like is that in our school we have developed a model of bespoke flightpaths created through detailed and highly scrutinised subject rationales that we feel confident are delivering reflective assessment across the curriculum. They have helped us with some of the challenges of differing curriculum time and varying experiences, starting points etc. My instinctive response to this model is that by building in our current rationale based process the flightpath expectation could be varied for different subjects at different points which maintains the flexibility that has been troubling me. Many of the ideas I’ve seen implicitly assume a linear progression model which in the working life of a school across a broad and balanced curriculum is in my view/experience naïve and will lead to inaccurate and invalid assessment and reporting of data. As referred to the moderation is key and I would be keen to hear about any plans to externally moderate your assessment criteria and/or student work as you move forward. Perhaps you don’t feel that is required? Thanks again and look forward to any updates you share on progress made. unonvinced that measuring relative performance compared to expectations based on prior performance is in the spirit of the Government’s ideal that everyone is capable of and should be aiming for the expected target understanding for each Core Idea at each Key Stage. To me it suggests a ‘fixed ability’ mindset – judging students based on what we already know of their prior performance. If I were excellent at primary, there’s little room to improve so I’m not sure I’d keep trying, and if I did poorly I will get praise by doing just a little bit less poorly – why not challenge me to get to the same level of excellence as everyone and – as Tim Oates quotes from Asian countries – just give me longer, and present the material in a way that will make me want to try harder. Thanks for the comment Tony. I think you may have misunderstood the system. We are not setting targets for students, or putting a ceiling on our expectations of them. We are using the thresholds to plan our teaching and the feedback we give to the students, with the view that all of them should aspire towards excellence. Taking into account their starting points i.e. KS2 scores, seems a sensible element of this process. I am very interested in your model for life without levels, especially as we are working on growth mindset currently. Do you simply set the grade from key stage 2 data and use that through Year 7-9. For example let’s say the student has a target of a 5 at the end of key stage 4. If they achieve above their baseline threshold in KS3 we give a +2. However this is unlikely to be the case, if the target is an end of KS4 target. It is therefore never likely that they will achieve anything other than -1. Or is this my fixed mindset? If you could clarify that would be useful. It may be that I have the wrong end of the stick from the web site. I must say that the work you have completed is very interesting and something I am very keen on starting from September. I just need to make sure that I can answer all staff questions / concerns before starting this.